Within 18 months, I could play thousands of songs and jam with all my friends. I don’t have to sing my guts out now that I have an instrument to play. It really helps to have a teacher who has a sense of what your next step is. Every time I come for my private lesson I get rejuvenated and inspired to play guitar. Thank you so very much for bringing JOY to playing music! I have taken guitar lessons from many different people and Quinn is the very best guitar teacher. I have been playing guitar for years and missed learning some very fundamental things that are essential to playing and song writing. Quinn always has material ready for the lesson, every lesson adds to my understanding of the instrument, and he is not distracted by teaching me how to play a specific song. He focuses more on the fundamentals so that I see how something in one song appears in hundreds of songs. After 13 years of playing, I’m finally learning the stuff I should have known years ago. Many people can play the guitar and play it very well, but not everyone can teach. I've been telling everyone about you and what a gifted teacher you are! My children and I have been playing a little worship music every morning before we start our homeschool. I don't think we're quite ready to take it on the road, but we're sure having fun! Thanks so much for teaching me how to play! Quinn's class focuses on the basic chords, chord changes and strumming patterns in different rhythm and time signatures. His handouts include a wide range of important background information about guitars,their maintenance and an interesting variety of simple tunes all carefully explained. I enjoy these classes and have experienced a reawakening of interest in playing with friends knowing now I can play "with " them harmonically and not just as a melodic lead. I have learned more in a month with Quinn then I was able to learn in thirty years of "picking" things up along the way. I expect my next thirty years of playing guitar will be much more rewarding. Here is a tidbit of news, I have been keeping track of my blood pressure for the past few years and earlier this week I finally had a good reading. All I can think of that is different is playing the guitar!!! Thanks for your patience. Quinn is an excellent listener who seeks to understand what your music goals and love of music are. He uses this understanding to teach in a way that is meaningful to the individual student. He is always supportive and encouraging, and at the same time has the skill to help you progress and feel good about your playing. At the end of a lesson I come away jazzed about playing guitar. In the short time that we've been working together, I've really learned a lot. I'm very happy with where I am at with guitar. Thank you! I took an Introduction course from Quinn offered through our local Community Education Center. A one time, 2 hour intro class for basic guitar. I sat in Quinn's class, there were 6 or 7 of us there all beginners and there for various reasons. The time flew by. I believe each of us felt we were gaining and understanding more than we ever had. It was like walking out of a great movie, we were all high, encouraged, we'd actually learned something. We laughed at starting our own band, The "Bloody Fingers" as our fingers felt like they were going to burst. Quinn answered our simple to complex questions. Without ever making us feel we were too far below to grasp an understanding. He was able to simplify and encourage us to just try and learn from mistakes, and small yet meaningful triumphs. Quinn doesn't stop at one skill set, or technique that might work, he went further, to show us, to open the door into what would be possible with just a bit of work. Somehow Quinn spoke in OUR language, not as an artist passing on his skills, but as people who come with little or limited knowledge. He was inspiring, and gave me at least that belief that this can happen. I may not be signing up soon for an open mic night - which is not on my bucket list....but that I can learn to play and enjoy a gift to self. I am going to give my Parlor Guild another try....I think it was in the teaching style and the message. See the Possibilities are endless..... That's Quinn's Gift. Here's to sore fingers, and strumming for my dogs. I have had guitar lessons with Quinn for about 18 months. Before that I had some experience in music but zero with guitar. When starting guitar I was also starting with a choir as part of my goal to sing pirate songs, sea shanties, and various more common folk songs with my guitar. Quinn's strengths were to blend my interests with guitar basics & songs I liked. Right off the bat he suggested songs that introduced me to finger-picking, strumming, and other basics. As I got a little better I appreciated his continued work at helping me work with songs I suggested for what would work for my growth with the continuing guitar lessons. At the same time, Quinn recognized my habit of getting excited about yet another song & suggested I stick with 3 until I worked them them to the end. In addition, Quinn continually provided "non-music" suggestions such as practicing some things for 21 days in a row to anchor it in habit or memory, to keep practice sessions shorter to keep them more steady, and aim for progress & not perfection, and don't forget to just have fun. Finally, no matter how I was doing, Quinn was >always< supportive & encouraging. Ok, but one final input, I have a full time job and numerous other commitments, so I have also appreciated how Quinn works with my schedule. I don't know how many other lessons are set up, but I feel lucky as well that Quinn makes house calls. In doing this he is always on time, and always provides his full time & attention for my lessons. From the very beginning of my 18 months with Quinn as a beginner on guitar he has provided interesting lessons for practice, and blended them with songs I'm interested in. With the basic techniques I can practice & experiment with now, and non-complicated songs that Quinn helped me work on so far, I no longer strum idly on a guitar & wish I could play. Quinn has provided not only guitar technique & music background but also insures the playing remains fun with the goals that I started with! 12 y.o. 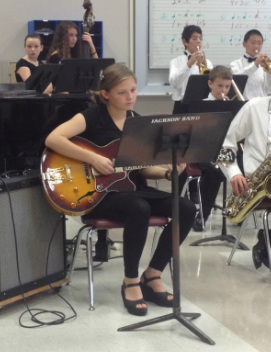 Zoe performing in a Jazz Band within 9 months of guitar lessons! We got so much more than great introductory guitar lessons for our daughter after signing up with Quinn Fitzpatrick. From the beginning, Quinn was responsive to our daughter's individual needs and musical interests. He is able to challenge her just the right amount every time they meet. This has kept her incredibly motivated and excited about learning more. We've noticed our daughter's confidence level soar as she masters new skills and songs; and it has spilled over to how she approaches everything from academics (reading more challenging books) and even relationships (coming out of her shell more with friends). She practices without prodding and after only six months of playing with Quinn, she was just placed into the intermediate jazz band (at the largest middle school in Seattle). Guitar is now her special, secret passion and Quinn's ability to keep it fun and challenging has made all the difference. Quinn turned my garage band skills into solid technical abilities. Within a few months I was performing solo in front of 150 people. 7 y.o. Nicholas Muller performs after 6 months of lessons. Nicholas has made a connection with Quinn which manifests in joyful, spontaneous playing of his guitar throughout each week. After 6 months of taking lessons with Quinn, Nicholas performed in front of a full house at a WICA Youth in Arts concert. Over the past two years of lessons he has performed at a wedding, fundraising benefit and many family events. I feel he has developed a love of music and guitar that will live in him always. 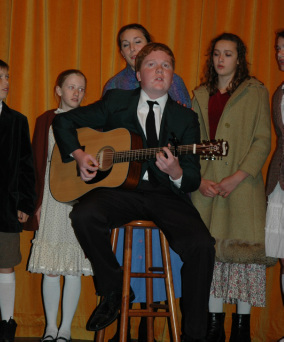 Liam started lessons as a wee little lad back in 2010. He is now almost 6 feet tall and is a lead guitarist in his school band.